See An All-New Laser Lightsaber Curtain Show Before the Movie! HOLLYWOOD, Calif. (Wednesday, October 21, 2015) – Hollywood’s legendary El Capitan Theatre presents a special engagement of Lucasfilm “Star Wars: The Force Awakens” December 18, 2015 through February 7, 2016. Before the movie, El Capitan guests will be treated to an all-new Laser Lightsaber Curtain Show and can explore El Capitan’s exclusive display of costumes and props from the movie. 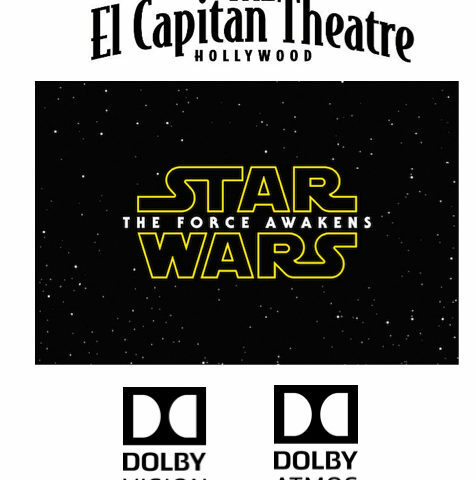 To usher in El Capitan’s special engagement, Nerdist Industries will present a STAR WARS Marathon event, sponsored by Dolby Laboratories, on December 17. Ticketholders to this sold out event will see the first six movies and be among the first to see “Star Wars: The Force Awakens.” Tickets for the STAR WARS Marathon Event include reserved seat, event credential, STAR WARS lanyard, commemorative souvenir ticket, collectible BB-8 Button, Subway sandwich, treats and more! Although the STAR WARS Marathon event is sold out, other ticket offerings still available at the El Capitan Theatre (6838 Hollywood Blvd. ), online at www.elcapitantickets.com, or by calling 1-800-DISNEY6. Each lucky Marathon Commemorative Souvenir Ticket holder has the opportunity for one additional complimentary admission to “Star Wars: The Force Awakens” at the El Capitan Theatre, Monday – Thursday from December 21, 2015 – February 4, 2016, subject to availability. Show times & dates are subject to change without notice. The complimentary admission offer may only be redeemed by Marathon ticket purchaser. Limit one complimentary admission per Commemorative Souvenir Ticket. Offer may not be combined with other discounts or ticket offers. Not valid on prior purchases. Other restrictions apply. For terms & conditions, click https://elcapitantheatre.com/static/TFA_Comp_Ticket_Legal.pdf or visit elcapitantheatre.com for details. Daily showtimes are 9:45 a.m., 12:55 p.m., 4:05 p.m., 7:15 p.m. and 10:25 p.m. with additional showtimes on opening weekend. Tickets are now on sale, and will be available at the El Capitan Theatre (6838 Hollywood Blvd. ), online at www.elcapitantickets.com, or by calling 1-800-DISNEY6. Special group rates for parties of 20 or more are available by calling 1-818-845-3110. Showtimes are subject to change. This engagement will kick off reserved seating at The El Capitan Theatre—all seating will be reserved for all showtimes of “Star Wars: The Force Awakens.” *BB-8 button will be available on opening day, while supplies last. VIP Comic Book Admission Ticket includes a reserved seat, popcorn in a souvenir tub, a 20 oz. bottled drink and a choice of two variant covers exclusive to the El Capitan Theatre. Guests can choose from 2 exclusive variant cover designs of Star Wars Vader Down #1 comic book from either Todd Nauck or Michael Walsh. On select dates, following the 7:15pm movie, El Capitan guests may enjoy an exclusive Cosplay and Cocktails event. The Cosplay and Cocktails Event ticket includes a private viewing of the costume display, plus beer, wine, soft drinks, hors d’oeuvres and a souvenir photograph. Movie ticket purchase required with purchase of Cosplay and Cocktails event ticket. The El Capitan Theatre will also host a very special Tiny Tot Tuesday at 10:00 a.m. every Tuesday during the engagement of “Star Wars: The Force Awakens”. During these special screenings, parents and small children may enjoy the movie in a tot-friendly way—with lights dimmed rather than out and reduced sound levels. Thank you to Davidson & Choy Publicity for the press release and images. Next article Meet the Cast at the Premiere of 'Star Wars: The Force Awakens' and Benefit Charity! Previous article Announcing the 'Bit Wars' Challenge from littleBits!